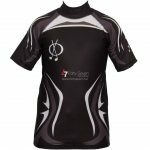 Sports Shirt is made of the latest technical fabric, designed to closely allowing flexibility, movement and extreme comfort enabling the players to reach a very high level of performance. It is very comfortable for all sizes which makes it a perfect choice for all age groups. Good for all sports and even for leisure wear. The Jersey can be provided in long sleeve version. SUB-TECH Fit: Slim & Tight Collar: Any except traditional Sub-Tech is a recommended elite fabric for top teams and clubs. Sub-Tech is highly technical making the fabric incredibly flexible and comfortable in any playing condition and it also comes with moisture management system keeping the athletes dry and fresh. Team wear made of this fabric can incorporate any design and logos in the form of sublimation without compromising the structure of the garment. Stan-Sub Fit: Standard Collar: Any Stan-Sub is an advanced 100% polyester breathable sublimated fabric weighing 300gsm, which incorporates an advanced quick dry formula helping the body to keep dry whilst participating in sports. Stan-Sub is also durable and flexible material which can integrate any design and colour into the jersey, including club and sponsor logos, during the manufacture without the weight increasing. RUGBY 250 Fit: Standard Collar: Stretch Neck, Crescent. This is a traditional standard fit durable fabric. 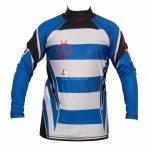 It is ideal for school rugby teams as it is able to withstand the stresses of competition and is a comfortable fit. 5% LYCRA Fit: Slim, Tight Collar: Stretch Neck, Crescent Jerseys made of this fabric come in slim and tight fit. It is a technically advanced sublimated fabric which offers style, comfort and potential to customize with designs and logos to suit your team’s requirements. Spandex content in the fabric lets it stretch freely making it very durable and suitable for a higher competitive level. 12% LYCRA Fit: Slim, Tight Collar: Stretch Neck, Crescent This fabric offers qualities similar to the 5% lycra while being thinner. This results in greater flexibility and freedom of movement, which makes it suitable for all levels of competitive rugby.